A journey of dance through the Polynesian islands with award-winning performers of Urahutia Productions, under the direction of Mi Nei Oliver Martins, Miss Garden Isle 2004 and 27-time 1st Place Tahitian Solo Dance winner. This performance is free and fun for the whole family — a great opportunity for dinner and a show. Come early to secure a seat — this is a popular show. 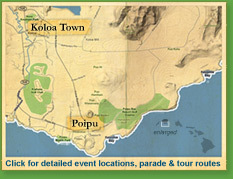 Additional parking and a free shuttle will be available beginning at 6 p.m. Just follow the signs on Kiahuna Plantation Drive to Kiahuna Golf Club’s parking lot. The shuttle will be running until 11 p.m.